For ever traveller who is also an avid shopper, Ladakh is a paradise. The city market, Alchi market, and Changspa are places where you can unearth some really unique things that are signature Ladakh souvenirs! 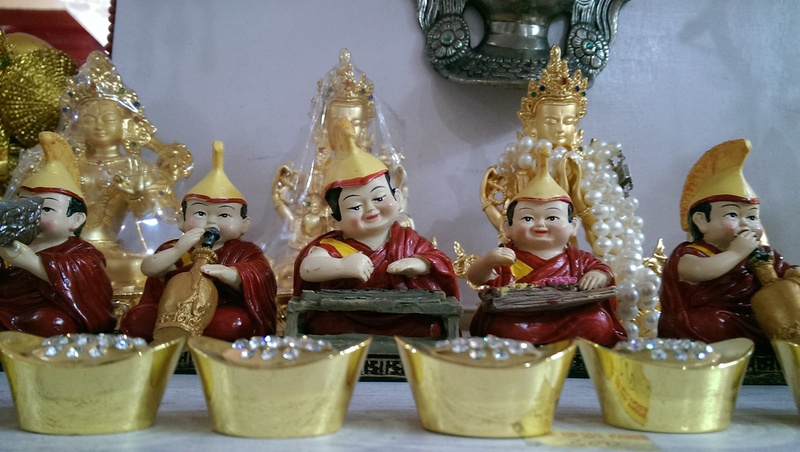 One will also find the common souvenirs that you get in any Buddhist neighbourhood like the prayer flags, prayer wheels, monk dolls, and more. This list is however my hits and misses during my 20 day long trip in Ladakh! The secret behind buying good silver jewellery in Ladakh is to know your silver. Check for the hallmark sign 92.5 on every piece that you buy before making payment. One particular shop in Alchi taken care by a brother and sister has some good collection of silver jewellery and otherwise. You will also find some nice collection of silver jewellery much cheaper and prettier than other metro cities! Check out different shops in the market before you decide on the statue. There are sleeping Buddha statues, the meditating ones, Maitreyi – the future Buddha and more! We got a great deal in the Alchi market where the sleeping Buddha with red and blue stone work cost us about INR 2,500. However, be cautious about the fake stone work, which is usually just plaster. The Hemis Monastery had some beautiful Tibetan tables that I missed because of luggage constraints. This is a must pick for anyone who loves to pick up interesting décor items as you travel! What makes it easy to carry is that the piece is detachable. We loved the variety of shawls and stoles that was available for us. This also made for a memorable souvenir for loved ones back home. Sari lovers also found some beautifully hand embroidered and machine embroidered sari’s in the Leh market. You can pick out some beautiful pashmina shawls too. One needs to check with the local guide before you get your woollens. Ladakh has some beautiful Yak wool mufflers and socks that is sure to keep you warm! Apricots, turquoise jewellery that Ladakhi women wear, thangka paintings, masks, handwoven carpets and rugs are some of the other things that you can get in the markets!